Read this article to learn why Madrid is a great place to raise kids, and discover the best family neighborhoods in Madrid and the Madrid city suburbs. From preschools to best MBAs in the world, Madrid has all you need in terms of education. Depending on your needs, some neighbourhoods are better than others. For example, all of the business schools are (logically) near the business district (located in the north) or in the Salamanca neighborhood. Most private bilingual preschools are located in the affluent Madrid city suburbs, whereas most high quality public bilingual schools are located in the center. To see if the neighbourhood you are considering is close to good schools, visit the interactive map above to learn about the Best Expat Schools in Madrid. Do a quick “Get directions” search to see how long it takes to get from a particular neighborhood to different schools. To learn how to choose the right school for your child, visit How to choose the best type of school for expat kids. If you want to learn about a school but don’t have time to visit it personally before you relocate, visit Exellence in Expat Education to see school evaluations. If your desired school isn’t evaluated, you can speak with them about soliciting a school assessment. The center of Madrid has the famous Retiro park. It contains elegant fountains, a crystal palace, a place where you can rent boats and acres and acres of trees and landscaped gardens. However, the line to rent a boat is usually quite long and the park is often over-crowded. Most kids prefer Madrid Rio. This is a 7km long park that runs parallel to the River Manzanares. It is lined with playgrounds and features toboggan slides, rope bridges and crazy swings. The best family neighborhoods in Madrid have plenty of little squares with playgrounds. The major street, Fuencarral, is pedestrian only on Sundays and holidays and filled with activities for children. Of course, living in the center in a flat is not at all the same thing as living in the Madrid city suburbs. Buying a house out here will give you lots of space- particularly if you have your own backyard. Madrid also has its own Egyptian Temple, whose fountains are a real temptation for kids to splash about in. Madrid is a very safe city. For example, in 2017 it had a much lower per capita murder rate than New York City or even London. There is a large police presence. Madrid, and Spain in general, has the highest police officer to civilian ratio in Europe. Spain has some of the tightest gun control laws in the world. The Metro is very secure, clean and modern. It is filled with undercover police officers so even pick pockets are often chased down and arrested on the spot. Spaniards stay out very late at night, so there lots of people on the streets at all times of the day. Even after their increases in 2017 and 2018, Madrid property prices are still some of the cheapest in Europe. The above chart is heavily weighted towards property prices in the center of Madrid. If you are interested in living in the Madrid city suburbs, prices can drop by as much as 20%. Although there are some some excellent quality to price ratio neighbourhoods out of the center, you will need a car if you live in the suburbs. If you live in the center of Madrid, you don’t need a car. You can walk your child to school, do your shopping and either walk or take the Metro to all sorts of kid friendly sites and activities in Madrid. Do you need advice on which is the best neighborhood in Madrid for you family? Book a FREE CONSULTATION TODAY to have a conversation with one of our property shoppers. There are 3 types of neighborhoods to consider, depending upon your lifestyle, budget and needs. *To see where these neighborhoods are located visit our interactive map of Madrid Family Friendly neighbourhoods. Pros: You do not need to own a car, close proximity of shops and services. You get the full Madrid experience! Cons: You are not likely to get a swimming pool, a garden or even an extra room or storage space unless you spend a lot more money than you would purchasing property in the Madrid city suburbs. Salamanca: The obvious choice for foreign families who want to live in a premium environment near the centre of Madrid. It is very quiet. There are great schools and services and the beautiful, quaint streets have large sidewalks (great for strollers and prams). Salamanca is not right in the center but it is very well connected and close to Retiro Park. Real estate in Salamanca is very expensive. Retiro: The Retiro neighbourhood is very similar to Salamanca. It is located just to the south of Salamanca, adjacent to Retiro Park. It is less expensive than Salamanca, but not as well connected and a bit further from the center. Chamberí: This neighbourhood is just north of the center. It is a traditional Madrid neighbourhood with many services for families. Its major street, Fuencarral, and its major square, Plaza Olavide, are pedestrian only every Sunday until 14:00 and filled with playgrounds and activities for kids. By Canal Metro there is a large public pool, tennis courts, paddle courts and a football field. Parque Santander is filled with fountains, playgrounds and is a popular spot for kids birthday parties. Here kids can take football lessons, paddle lessons and even attend summer and winter sports camps. Chamberí is arguably the best of the best family neighborhoods in Madrid. It is better located and sometimes less expensive than Salamanca, has good schools and is filled with activites for kids. Pros: More zen than the centre, while still having access to services close-by. You can still do without a car, although a bit more challenging than going carless in the center. Cons: Usually very residential, lacks the distinctive Madrid character of the centre. Conde de Orgaz: A neighborhood with a very strong expat community, especially French speaking as it includes the Lycée Français. Arturo Soria: A favorite for professionals who work in the north eastern area of Madrid. It contains many private or semi-private schools and features easy access to the airport. El Viso: A secret enclave. It is the only neighborhood close to the centre that has villas, as opposed to flats. It is such a secret that prices and properties are at luxury levels. The market is very closed so it can be quite difficult to find a house for sale. Puerta de Hierro: On the outer limits of Madrid. Most of the properties are of modern design. It is a great solution if you want an exclusive, modern environment very close to the centre. Mirasierra: Located just north of Puerta de Hierro and slightly less exclusive. It is mid-way between suburbs and the centre, in terms of location and style. The Metro still goes here and you can walk to shops, but it is still a neighborhood of houses. Pros: You get quality properties for the same budget as a two bedroom flat in the center. It is easy to find a place with a swimming pool, garden (private or shared), ample space, storage facilities and lots of light. Cons: You have to drive most of the time. There is still public transport, and neghborhood cafes, but you need a car. They are also, because they are suburbs, a bit generic looking. In the Madrid city suburbs, just beyond the limit of the circular metro line #6, and the circular road M30, are Pozuelo and Aravaca. They are the typical places affluent families buy property to have more space than the center of Madrid. They boast a very high quality of life and the flats are much better quality than those in the center. There are plenty of supermarkets, schools and services. Conveniently, these neighborhoods are only one station from Madrid. The large forest to the west of Madrid is very close so you can enjoy a stroll and quiet time with your family. In a nutshell, we recommend Pozuelo, Majadahonda, Aravaca and Las Rozas in the north-west. In the north-east we recommend La Moraleja. Pozuelo and la Moraleja have the most exclusive properties and communitie in Madrid. To illustrate, Cristiano Ronaldo and Mourinho live in Pozuelo. Would you like to see properties in any of the best family neighborhoods in Madrid? If so, do not hesitate to send us an email to get started on your property search. Yes, it is good idea ! We have left out many options while doing our list and update it. Thank you again for your good comment ! Hello! Very good list indeed. In my opinion there’s just one area missing that is 100% families, with an awesome quality/price take and it’s the area of Barrio de los Metales and Planetario. On one side, the wonderful Tierno Galván park and on the other, Madrid Río park . It’s a recent area that’s filled with families with young kids, wide clean streets, no traffic, all apartments have swimming pools, gardens, gym, playground, indoor kid playrooms and adult rooms to get together, bike parking, garages, storage rooms…. and some even have tennis courts, indoor pools, etc. It’s also one second access to M30 and M 40 if you have a car, and there’s never any traffic or parking problems so if you have a second car you can park it right in front of your door every day. May be a good one to add when you update this list. Great job with all the detailed info, it’s great to see good content on the internet, for a change!! Thank you for your two comments ! Yes, indeed, there are no reliable reviews of schools available. That’s why we had to do our own selection. Do check out our interactive maps with our selection of international schools: http://moving2madrid.com/best-school-expat-kids/, as well as our top 3 selection to cover typical locations: http://moving2madrid.com/madrids-best-schools-top-schools-by-location/. 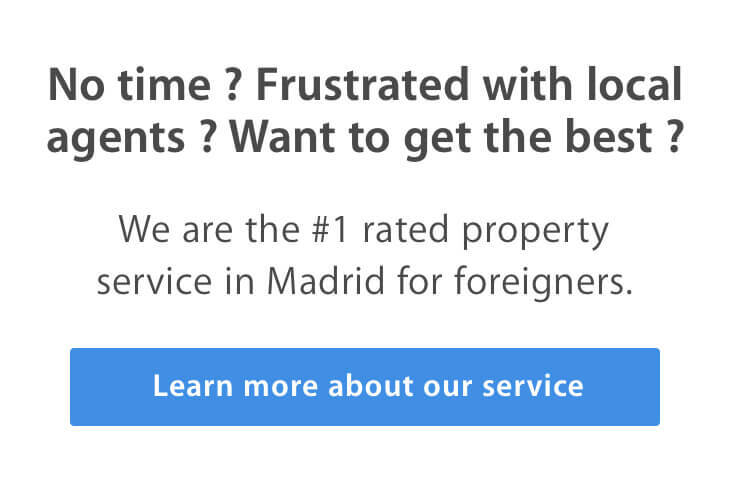 You’re post and website has been very helpful to me as I start to plan our move to madrid in September/october 2015. However, I am unable to find decent information on the web about neighborhoods with top public schools and the names of schools listed. Do such things exist? Reviews of public schools etc are very common in Chicago/US and is what helps families decide where to move their family to. just hoping I can find something comparable when making a decision on what neighborhood in Madrid to move to. BTW my husband is from Ibiza Spain,and was living in madrid for years before coming to Chicago, where I am from. We plan to move back with two young daughters. Center of Madrid is fantastic but if you are a family like us that needs space you are going to quickly look outside. Luckily there are loads of great options. Las Rozas, Pozuelo, Majadahonda, Pozuelo are all great suburbs (but read carefully “suburbs” in UK term). Lots of newly built estates, semis and flats mostly. Is all very modern but a bit soulless for our taste. But then it takes all sorts. If you´re here short term, central areas are best… if like us you come for 2 years and end up staying for more than 10 you´ll probably love living in these gorgeous mountains so close to the city. Surprising number of expats in all the towns mentioned too. Mostly with kids. Torrelodones, Villalba and Galapagar are all nice towns where I have friends. Truth is though that they are all 30 min out of Madrid entre, 15-20 minutes further minimum than Pozuelo for instance. Most of our clients find Las Rozas too far already, as they are looking to discover Madrid ! Yes, it is indeed a neighborhood we consider in some cases. A residential neighborhood of Madrid, mid-way between suburbs and the centre, in terms of location and style. It has the metro, you can walk to shops, but still it a neighborhood of houses. Its style is very much alike what you would see in South London districts. If you need specific help, do not hesitate to comment here or send us your questions to email (at) moving2madrid.com. We’d be happy also to answer your questions in a free consultation and see if we can help you. Hi Pierre, your blog is great! Wanted to know your opinion of the neighbourhood Mirasierra? I see you do not mention it anywhere… but have heard it can be family friendly too, what do you think? Clearly it’s a low budget for Madrid centre, and will be easier to get more space for your budget in the apartments close to campus. I will move with my wife and baby daughter on early May to work at one of the institutes at the UAM campus. I have reserved a campus housing for a month. I noticed that Alcobendas is a close town to the campus. Do you think I can find a decent 2BR/1Bath, furnished flat (queen bed, TV, a sofa, a dining table with chairs, probably a baby crib, kitchen appliances and utensils) for around early June? My budget is around 800 Euro. Please advise. Again, your helpful blog deserves high commendation. Again, I would like complement your helpful blog. I would recommend Villalba, just next to the mountains of Madrid but still 30 mins from the city.